I received a call from Brett at a natural gas provider in the mid-west. Last year I started working with some of his colleagues on various other industrial filtration projects. Due to our good relationship, he came to me this time to request that we put together a specific application for a new fuel gas maintenance project that he was working on. Brett’s company is required to supply clean, dry fuel gas to its customers. Two of their stretches of gas pipeline were getting old. As pipes age the deterioration can contaminate fuel with pipe scale. Over time, gas streams also have the potential to pick up moisture during the production and transmission stages. Neither of these conditions are conducive to providing clean, dry fuel. Due to the age and historical use of the pipes, Brett and his team had concerns about their interior condition and the potential for particulate debris to contaminate their fuel during transport. 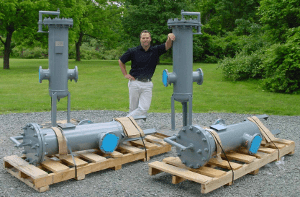 I know from years of experience that there are specific manufacturers that offer fuel-water separator filters for removing both particulate and water. I thoroughly reviewed Brett’s application details such as flow pressure, flow rate, connection size, fuel temperature, fuel type, and target ISO 4406 cleanliness levels. I then contacted one of our vendors, knowing exactly which equipment I should request. Ultimately, the solution that I suggested to Brett and his team was the installation of an in-line pre-filter with a coalescer-separator vessel. The first stage was the high-efficiency pre-filter which was installed to remove the pipe scale, rust, and particulate contamination from the fuel gas stream. The second stage of the operation consisted of the coalescer-separator filters (PDF), which were put in place to remove water, oil, and any other free liquids. I quoted Brett for this system within a few days of him contacting me, and our team was then able to deliver it to put everything together and get this one-two filter combo delivered to him within only 6 short weeks. I recently received positive feedback from Brett and his team, which made me glad that we did our job well. Success! Do you have a question about natural gas filters or filter systems? Feel free to contact us anytime. Our friendly team of experts will be happy to help you out with your particular issue. P.S. Have you seen us in our latest VIDEOS? If not, click here to check us out now!